We had suite dorms as well, although it was 2 girls to a bedroom with a shared bathroom. But I love how easy it was to just throw on a robe if I was too lazy to get dressed and wanted to just lounge around in my room! Thanks so much! I totally agree about the robes, great to just throw on! Love this guide Sami! 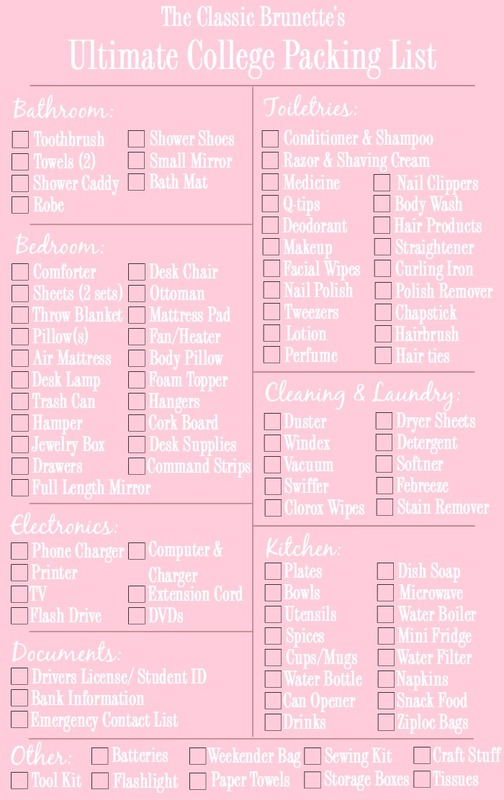 I'm moving into my very first apartment by myself in August and I will definitely be consulting this list! Thanks so much Cristina! Excited to see your new apartment!! That's so cool! Target is the best! Great guide Sami, I don't get to go to a dorm room for school because I only live an hour away from my school but I live with aunt while I got to school so i decorate the room I have at her house!! Thanks so much! That's still great that you have a place to decorate down at school! Okay, I need that pineapple lamp immediately. All of these items are so cute. Haha, isn't it just too cute? This is such a great guide! I definitely could have used this a few years ago when I first started college! What a great list! I was so unsure what to bring when I first left for college. Thanks so much! Packing was so confusing when leaving for college! This list is great! I definitely over-packed for my freshman year. Haha, same here! Thanks for reading! Thank you for this. It's so easy to forget essentials when packing. Nice post! I am going into my second year in a dorm, I love it. I love designing the space! Decorating my space is the best part about college, haha! YES! I agree, those things disappear to friends who once "borrowed" it! This is an awesome list! I love that you made it printable! I love this guide Sami! I would have loved something like this back when I was a freshman in college and had no clue what I needed to bring haha. Such a great checklist, I want to go back to college! What an awesome packing list! Packing for college was probably one of the most stressful things ever! I agree! Thanks so much, Amy! I added shower shoes! And I definitely agree on feminine products, but thought those would be a given, haha! Omg 8 suitcases! I overpacked too, it's hard to think of just bringing the essentials when you're excited and stressed out at the same time while packing! Thanks for reading! This is such a great list and I love the examples you left! Packing for college is so stressful each year and I always need checklists so I don't forget anything. Yours will now be the one I use this year! I SO needed this packing list when I was in college. What a lifesaver! You definitely covered it all. When you are packing up after Christmas you may not need to pack as many belongings but the same rules apply so that you can make your packing and unpacking easy to do, without causing you any extra stress.